I want to let you know how appreciative I am for your winning the workers compensation death claim concerning my late husband. As a result of your efforts, I received death benefits going back over two years and will be paid benefits for the rest of my life. You were also able to have the BWC pay the funeral expenses. I know that it was a very difficult case to win as my husband had a lot of different medical conditions which were unrelated to his injuries. Thank you again for everything. I can’t thank Mr Pavick enough for all of his hard work in getting a large settlement for me in my auto accident case. It was a much larger settlement than I expected. I’m glad I came to Pavick & Pavick. Attorney Pavick won the allowance of my workers compensation in court against the self-insured employer who fought my claim. After the allowance the employer fought my doctor’s request for knee surgery. We had to go to hearings which we won. The employer had to pay for my surgery and all treatments as well as compensation. After I recovered, Attorney Pavick obtained a very good settlement for me so that I could start my own business. I am very gratetful to Attorney Pavick for his tremendous legal work. I just referred my husband to Attorney Pavick on a workers compensation case. 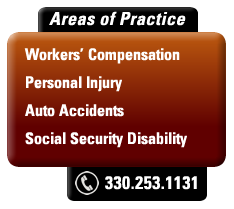 Pavick & Pavick LPA represented me on my personal injury case and workers compensation claim. I chose the Pavick law firm because they were very experienced personal injury lawyers and workers compensation attorneys. I definitely made the right decision. Attorney Pavick settled my auto accident case for the maximum policy limit(6 figures) and negotiated a significant reduction on the workers compensation lien with the BWC which put a lot more money in my pocket. He always kept me updated on my cases and quickly returned my phone calls and e-mails. I highly recommend the Pavick law firm. Thank you Attorney Pavick for recently winning my Social Security Disability and SSI claims with the hearing judge. I know it wasn’t easy winning these cases because I had coverage problems, unfavorable Social Security doctor reports and had been turned down twice. I am finally eligible for Medicare and Medicaid coverage. I now have some peace of mind with my financial situation and payment of medical treatments. I also want to thank you for the good settlement you got for me on my car accident case. You did a great job winning my workers compensation case in court. I think you are the best! I originally found the Pavick Law Firm online while searching for a workers compensation lawyer in Akron to represent me on my comp claim which had been disallowed by the BWC. In reading through their website the lawyers looked very experienced and knowledgeable and so I called them. I was a little nervous as I had never talked to a lawyer before. I was immediately put through to Attorney Dean Pavick. He was very friendly and spent a long time on the phone with me discussing my case. He made an appointment for me to come in. He had already reviewed my claim and told me it would be tough case to win because I could not point to exactly when I got hurt at work. Attorney Pavick won my case at a hearing based on a gradual injury. All of my medical bills have now been paid by the BWC and I was able to get the type of treatments necessary to get back to work. Attorney Pavick also filed a motion and obtained over 6 months temporary total comp payments. Attorney Pavick has represented me for many years. I first came to him with my workers compensation case. I was getting the runaround from the BWC. My medical treatments were being denied. Attorney Pavick put everything together and straightened out my claim. When the Commission turned down my request for permanent total compensation Attorney Pavick filed an appeal with the Court of Appeals in Columbus, Ohio and persuaded the court to reverse the commission’s decision and award me PTD compensation. Attorney Pavick also won my social security disability case with the judge. He also represented my son on a personal injury case. Thank you Attorney Pavick for all your hard work! Pavick & Pavick have represented me on 4 different workers compensation claims and two personal injury cases over the past 20 years. I have been extremely satisfied with their legal services and results achieved for me in my cases. I appreciate the fact that they always keep me updated on the progress of my cases, promptly return my phone calls and send me copies of all correspondence. I have been so pleased with the legal services of Pavick & Pavick that I have referred my son, brother, my sisters, other family members, friends and acquaintances to them over a 20 year period. They have all thanked me for referring them to Pavick & Pavick, and they have also referred others to Mr. Pavick’s office. My mother recommended me to the Pavick law office. She was a longtime client of Attorney Pavick. I had 2 fingers amputated on a machine. Attorney Pavick got a safety violation award for me in my worker comp case and also sued the employer and settled the intentional tort case with the employer’s insurance company for a good sum of money. Attorney Pavick and his staff always treated me very well.